A distinguished group of scholars from Germany, Israel and right across the United States are brought together in Nazi Law to investigate the ways in which Hitler and the Nazis used the law as a weapon, mainly against the Jews, to establish and progress their master plan for German society. The book looks at how, after assuming power in 1933, the Nazi Party manipulated the legal system and the constitution in its crusade against Communists, Jews, homosexuals, as well as Jehovah’s Witnesses and other religious and racial minorities, resulting in World War II and the Holocaust. 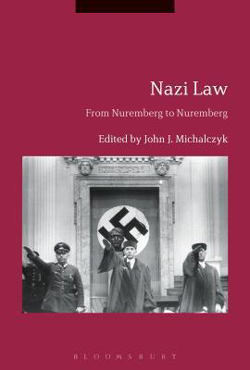 It then goes on to analyse how the law was subsequently used by the opponents of Nazism in the wake of World War Two to punish them in the war crime trials at Nuremberg. This is a valuable edited collection of interest to all scholars and students interested in Nazi Germany and the Holocaust.